The mytical Caves of the Tayor are found in the Ecuadorian jungle, in Jibaro territory (we wish to state that the Jibaro name is derogatory to them and for their respect they are liked to be called shuaras as themselve are known). The Shuar people live in the southwest of Ecuador in the foothills of the Andes were merges with the Amazon Basin. Access to the caves is made possible thanks to their help, since the shuaras know the location because of being lovers of the meat of the tayo bird or ¨tayu¨ in their language, strange nocturnal birds that inhabit this caves for which their name is derived. 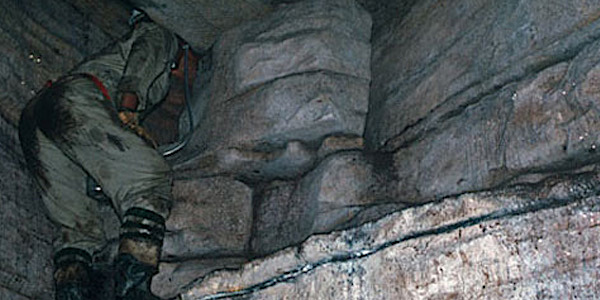 The main entrance to the caves is a kind of fireplace carved in the rock over 60 meter free fall. Inside, controversial explorers like Juan Moricz, Erick von Daniken, or priests as Carlos Crespi had found, in his stories, pictures of stone and gold with engraved ideographs. In early seventies archaeologists were surprised to read in the work of Erich von Däniken, "Gold of the Gods", a detailed description of a vast network built by an unknown civilization in the Ecuadorian Amazon jungle tunnels. With its story writer and Swiss researcher immortalized forever without knowing the famous "Cuevas of the Tayos" and the seemingly complex system of tunnels and unexplored that leave from her womb. 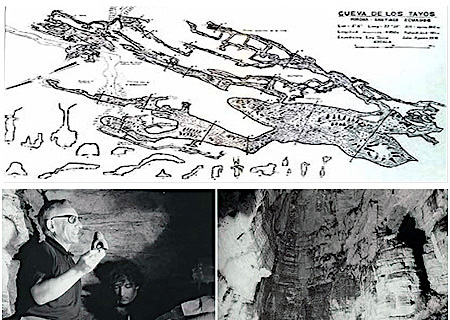 In their interior, controversial explorers like Juan Moricz (supposed discoverer of the caves in 1965), and priests like Carlos Crespi, have found plates of stone and gold, engraved with symbols that describe, according to them, the origin and the history of man. Däniken interpreted that as proof positive of the visit of extraterrestrials to the planet, while other more cautions investigators preferred to hold off making conclusions until they could examine the evidence. 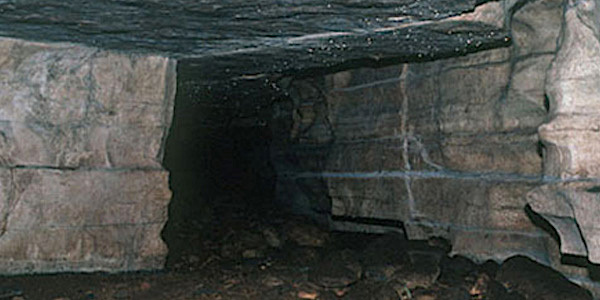 Däniken said that he had been inside the caves with Juan Moricz (later found that was not true) and not specify the exact location of where it was said. Only he merely ensure that "in the province of Morona-Santiago, in Gualaquiza, San Antonio, Yaupi region triangle inhabited by hostile Indians, is the entrance, wide as the gate of a barn, made in the rock". 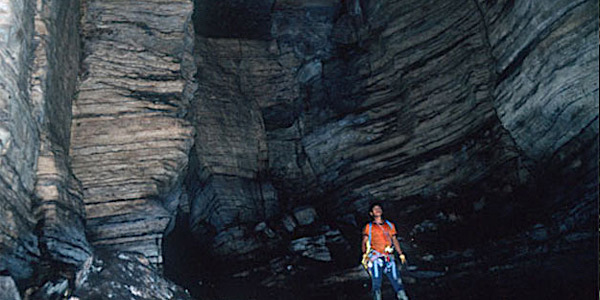 Artificial caves built by an unknown civilization or natural caves? 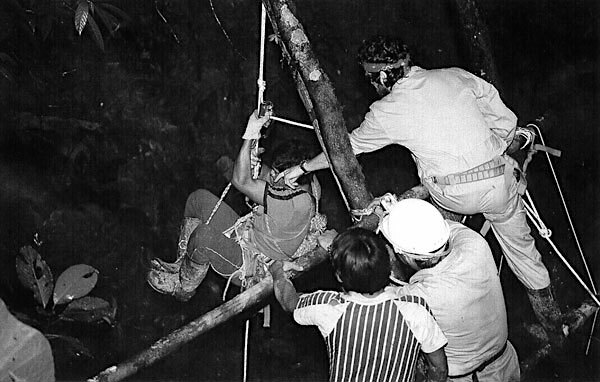 In 1990, the explorers Francesc Serrat and Angela Dalmau, Pi Rambla members team at the time, made an expedition to the Ecuadorian jungle to explore Tayos Caves accompanied by the Shuar Indians. Francesc was able to descend inside making an a detailed investigation, and the conclusions reached differ greatly from those raised and disseminated by Eric Von Daniken and Janos Moricz. 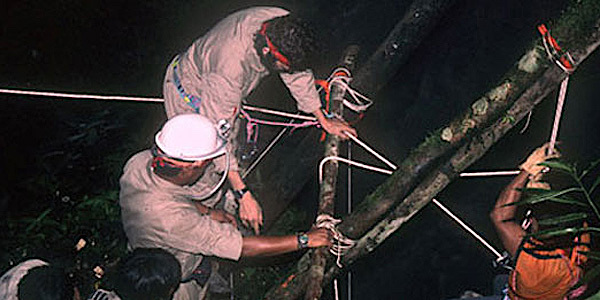 With the help of skilled Shuar, we had a log structure that would serve as support for the string of descent. One of the Shuar offered to guide us into the galleries, which he knew to perfection. The descent was very hard, not only for the 60 meters, but also because the inexperience of the Shuar with modern speology tools. At about 300 meters from the mouth, and under the earth, the great gallery where supposedly the findings of Juan Moricz occurred and where the Ecuadorian-British scientific expedition of 1976 (Priest Porras) found the remains of pottery and ornamental objects opened. Before arriving at the great hall they recognized and photographed places mentioned by Däniken and also shown on their books. As Daniken was never there but we assure is the same place as the photos published in the books that Moricz gave those photos to Daniken. But, whas it the same cave where Juan Moricz discovered the important library or was a fantastic story that he wanted to confuse?. The walls of the tunnels seem by a work made by man and the photos make it even more obvious, but in fact its formation is "natural". 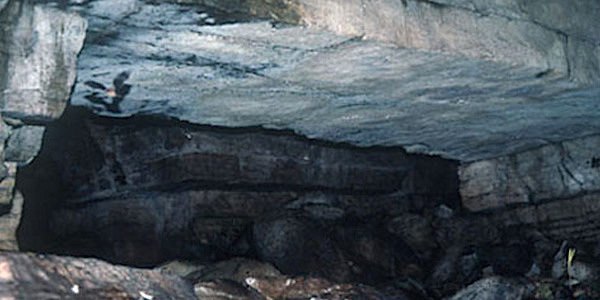 Both outside and inside the cave, the rock falls or is separated by slabs, leaving behind perfect angles. After following the Shuar with difficulty through the galleries, we came to a large room, tayos favorite place for concentrating and nest. Illuminating the ceiling with the beam of the headlights to about 20 or 30 meters, hundreds of red dots glowed, they were the eyes of tayos resting in the cavities of rocks on their nests. These are small and have a cone with a small hole in the end. The nests reach a certain height over the years with excrement and seeds that are formed. When the Shuar entered the caves in times that no chicks, hunt stick blows tayos all they can. This was the case of our companions. Within the large gallery they jumped and shouted corralling some tayos to the narrow galleries where they were hit with sticks. As we walked with difficulty plunging our boots in the fertile and stinking guano and watching that by supporting our hands on the walls or on the floor were not to rest on a scorpion or a tarantula. By carefully illuminate the walls at our fingertips we were surprised to discover the presence of numerous insects some of them look scary but totally harmless. "I hope that whites have not visited the forbidden zone"
This remark suddenly opened new confusions: were the kind indians hiding something to us?, If that wast the case was it the mysterious treasures ?, or rather referred to areas where their gods live and where they still claim to have seen their footprints?. That made us to explore more closely around the main Entrance of the galleries. Researching near the area we finally found other side entrances of the cave, but with a very difficulty to access. We found a narrow gallery that was not on the map of the expedition of Priest Porras. We found races of a jaguar, which spoke to other entries in the same cave but on level ground and mark an impressive anaconda communication confirming us in one of the galleries with the river. 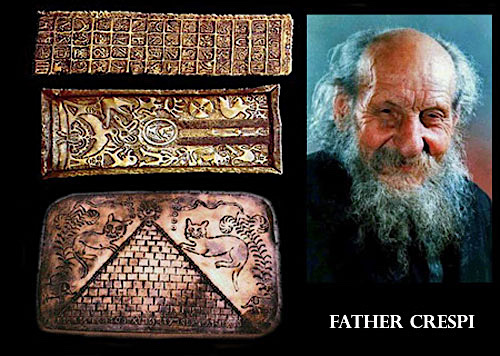 For many, the first solid evidence presented by Erich Von Däniken about the tunnels of Ecuador was his report about the mysterious gold plates in the custody of father Crespi. However, there were some investigators, refusing to be blinded by Däniken’s dazzling conclusions about the extraterrestrial technology that made the tunnels, who began to ask about the significance of the plates based on the images shown by the Swiss researcher. The first surprises came in 1976, when the hindu philologist Dileep Kumar Kanjilal, published on the front page of the North American publication “Ancient Skies” his revolutionary conclusions on the symbols that appeared over one of Crespi’s pieces: one platet of gold 52 centimeters tall, 14 cm wide and 4 cm thick over which 56 signs had been recorded… that is to say, something that invoked an unintelligible, ancient kind of alphabet. “The erudites are of the opinión, Kanjilal pointed out on her first approximation to the enigmatic gold plate, that the incas did not have a written language in an alphabetic sense of the term. But the letters found (on the plate) clearly point to the existence of a very developed form of writing in South America some centuries before the birth of Christ, and meticulous analysis reveals that the writings of the trail belong to the writing class Brahmi, used on inscriptions written in stone, plaques and verses that mainly pertain to the Asokan period of history in Inda, in the 3rd century before Christ…” . Kanjilal continues with his explanations adding that of the 56 visible signs on the plate, half of a hundred are perfectly identifiable with Brahmi signs, and that even in other steles of Crespi similar identifications reaches even larger percentages. What is surprising about his affirmation is, not only his precise identification, but that it completely destroyed the hypothesis of the fraud. And if it doesn’t have to do with fraud, how can the presence of Hindu symbols in Ecuador? “The offering of the oblations and the murmuring of those praying is spontaneous; the murmuring of those praying could by itself reach heaven, like Sudâsa who was also raised (to the heavens). Oh you, powerful God, let us pray with the Sudras while we subject ourselves to physical pains. Let us meditate in you, who lives far away from the waters, who comes with the clouds and who possess sharp claws.” . The text, as often happens in this type of archaeological controversies, instead of clarifying mysteries, it raises more queries. Father Crespi, a salesian of the Maria Auxiliadora Church of Cuenca (Ecuador), died in 1984. His treasures were sold one year after his death to the museum of the Central Bank. The collection was enormous and before its acquisition a selection was made where they discarded a heap of false pieces that already in the father's senility, the Indians handed him in exchange for some money: tin pieces and figurines, cement and other modern materials. Publication Center, Pontifical Catholic University of Ecuador, Quito, 1978. Father Porra had participated in a British-Ecuadorian scientific expedition in the year 1976. In his book he talks about the archaeological findings that made the ecuadorian components of the expedition, evaluating the disagreement in methodology of the work of Ecuadorians and the Brittish. There is no mention of the visit to the site by the astronaut Neil Armstrong, commented by other investigators, that which makes us think that the Father Porras was very removed from the mysterious topics or he didn't lend them any interest, or he maintained in secret some of his findings. 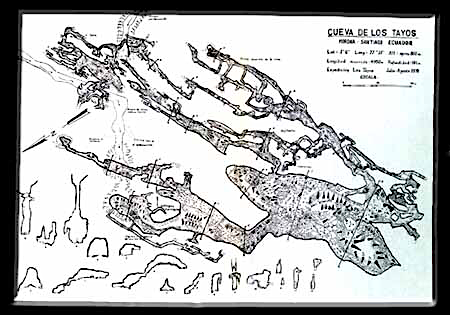 However in the book contains interesting data, such as the exact location, a map of the cave, the verification that there was human life (the ceramic discoveries and ornamental pieces, date B.C. of the year 1200). 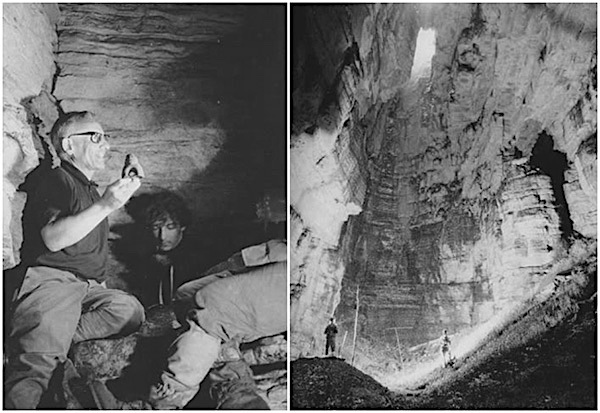 In 1986, our great friend, already deceased, and member collaborator of the Bohic Ruz team, the writer and researcher, Andreas Faber Kaiser, ventured in an expedition in solitary, until arriving to the same site of the famous caves. Andres never descended inside them, but according to him he was able to rescue he said, the zealously guarded secrets of the now deceased Juan Moricz. "You are the first foreigner that was ever bold enough to go to the caves alone. Others have tried, but no one has ever gone alone. My respect for you has grown enormously. The next time you come, I promise to go with you to the jungle. The only thing I ask is that you do not publish absolutely anything you have seen nor anything that I have been explaining." Among the voluminous documentation that Juan Moricz gave me when I returned from the jungle was a copy of the Notarial Deed of the official denunciation of his surprising finding appears. He presented it almost 20 years ago to the Minister of Finance, and through his intermediary to the President of the Republic of Ecuador, to firmly leave the accuracy of his statements. "I discovered, in the eastern region of the province of Morona-Santiago, inside the limits of the Republic of Ecuador, precious objects of great cultural and historic value to humanity, which consist of metallic sheets that elaborated by man, contain the historic relationship of an entire lost civilization of which mankind still has no memory or indication of. Such objects are found grouped inside various and distinct caves, being of diverse classes inside each one of them. I have carried out this discovery in an entirely fortuitous way, in circumstance that, in my scientific quality, I investigated folkloric , ethnological and linguistic aspects of Ecuadorian tribes. The objects, through my findings, have the following characteristics which I have personally been able to verify: One: Stone and metal objects of certain size, form and colors. Two: Sheets of metal carved with signs and ideographic writings, a true metal library that contains chronological relation of the history of humanity, the origin of man on Earth and the scientific findings of an extinct civilization.". “I ask that you designate an Ecuadorian National Supervisory and Control Committee, only the members of which will know the exact location of the caves and caverns that contain the objects discovered. I firmly sate that I reserve the right to later on, present before whom you should choose, photographs, movies, and even original samples that could be used to enlarge the depiction and clearly identify the form, size, composition and quality of the objects of my findings. Additionally, place on record that I reserve the right, that is mine by law, to let them know the exact location of the place where the objects were discovered once the committee that I have requested has been carefully selected to include scientists, researchers and observers, and has been officially appointed, and I, for my part, will appoint it to safeguard my rights.”. In fact, I could have published a book on my trip to the Tayos (Tayu Wari in the language of the native ones) as soon as I returned to Barcelona, in the spring of 1986. But it did not seem ethical to me. I preferred to keep searching in this direction, like in so many others, in silence. I preferred the stance of the same Moricz, when I asked what would happen if he died before he could give the world the message that had been brought from the interior of the caves: "Nothing would happen. Then I wont have been made the one elected to give this message.". 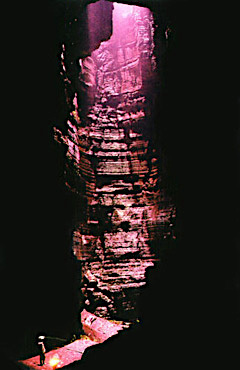 Once the dark chimney over 60 meters deep descended to where the sacred birds called the tayos nest, the first 300 underground meters traveled and the great site baptized by Moricz as ¨Domo de Nuestra Señora del Guayas,¨ it is necessary travel by two large caves, until a 90 degrees corner which forms the same passageway bends, and continue to a curve in an opposite way. From there you end in a circular room. In its center there is a round table carved in stone, surrounded by seven chairs that are also made of stone. In the rock wall, behind each seat, a rectangular opening. From here it is necessary to penetrate the opening that is guided toward the South. A small, short and strait passageway, ascends through a very unpronounced slope. After a long hour of slow ascension, the tunnel turns to the Southeast and now ascends in a very steeper slope. Soon after, the tunnel narrows even more, continuing down, it is necessary to continue by crawling. After a little while light is perceived at the end of the slope. The mouth of the tunnel remains separated from the exterior by a powerful waterfall that covers it completely. Once the waterfall is crossed, you arrive to a hill, opened in the summit of the virgin jungle, and that opens the way to an enormous grotto. Next to her, in the wall of the rock that forms a cliff to lead over the virgin forest that is seen in the valley below, a slippery road forms a very narrow edge that goes to another opening –this one small- in the rock: it is a small cavity only three meters deep. On the floor of this small room there are two square slabs each side half a meter. Underneath it, a narrow stone stairway, that it is necessary to descend until arriving to a dirt floor cave. At the end of the same one, an extremely dangerous slope that ends in a new grotto that harbors a small lake about 40 meters wide. Continuing from here a horizontal gallery that extends to about over a kilometer in length continues, to later shift to the West and begin a gentle downward slope. Through this road you arrive to a new grotto after a long hour of walking, much smaller than the previous one, and that also has a small interior lake. When removing the water from this lake (a phenomena that takes place in certain circumstances) the bottom appears, some ten meters down and a room beside it. After a few meters, a long upward stairway goes toward a new main, horizontal, extremely narrow passageway approximately over a meter and a half tall, that advances in a spiral. At the end, a very steep descending stairway. Later on, a new cavity, in whose center is a type of altar. Further on, an enormous portico opens the way to a wide gallery, that is comfortably retraced until arriving to a soft slope that ends in a grotto. In this grotto, a light coming from a type of revolving lamp illuminates numerous human skeletons completely covered in gold. Next to them, enormous quantities of jewels of all sorts. In the center of the room is a table or stone desk, and on which there are books whose pages are made of gold. Their pages are covered with hieroglyphics that contain the history of all the civilizations on Earth. The inhabitants of these caves live there. Lower than us, they move as shadows in the dimness. No stranger should touch anything he sees there. Otherwise, you will never find your way out again. Geologist Theo Toulkeridis explains the purpose of the next expedition to the Tayos.